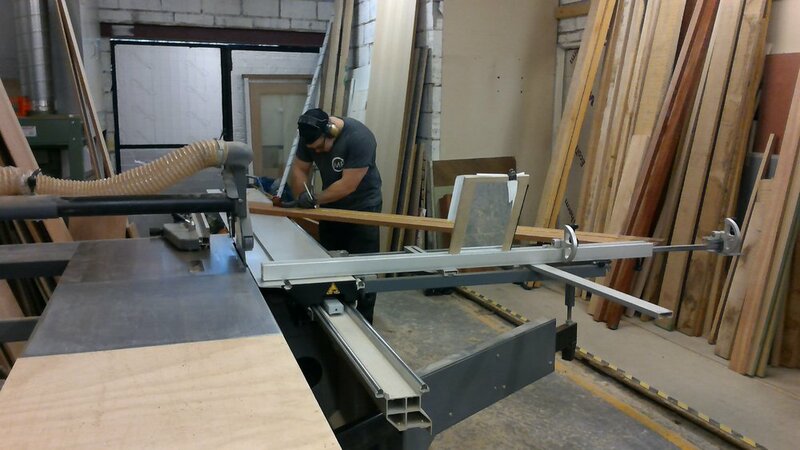 This week Matthew has started making some bespoke garage doors for a customer in Borde Hill, mid-Sussex. They are to match existing garage doors. The ones we are replacing have been there for over 100 years, so we have sourced some quality Utile to make them from in the hope that our doors will last even longer! Tony is currently working on some very deep, large wardrobe units, which will eventually have lighting throughout. The carcasses are finished, just need to finish the doors so they’re ready to go into the spray room before the weekend. Many people don’t realise that we make and then assemble everything in the workshop to ensure accuracy. Once Matthew is happy that everything is spot on, it is all disassembled wrapped up and its ready for transportation to site! It can seem like a long winded process but with bespoke furniture and a lot of the time, fitted furniture, there can be no room for error. We have been approached to make a table mount for a boat, which is a space we haven’t worked in before, so rather exciting as we’re sure you will agree! Fairly certain there will be lots of pictures to follow!